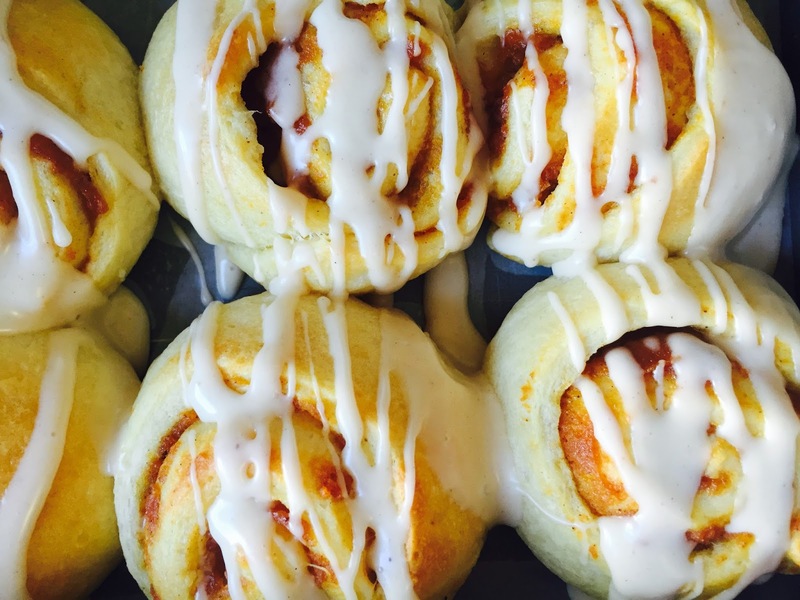 Cinnamon Rolls in 30 minutes? 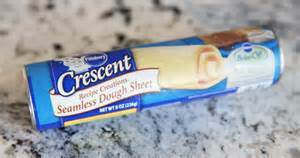 Yep, it's totally possible thanks to this convenient short cut - Pillsbury Crescent Roll Dough Sheets! While I'm a firm believer in baking from scratch, there are times when you just don't have the time or energy. It's times like that when it's totally fine to take a short-cut now and then. 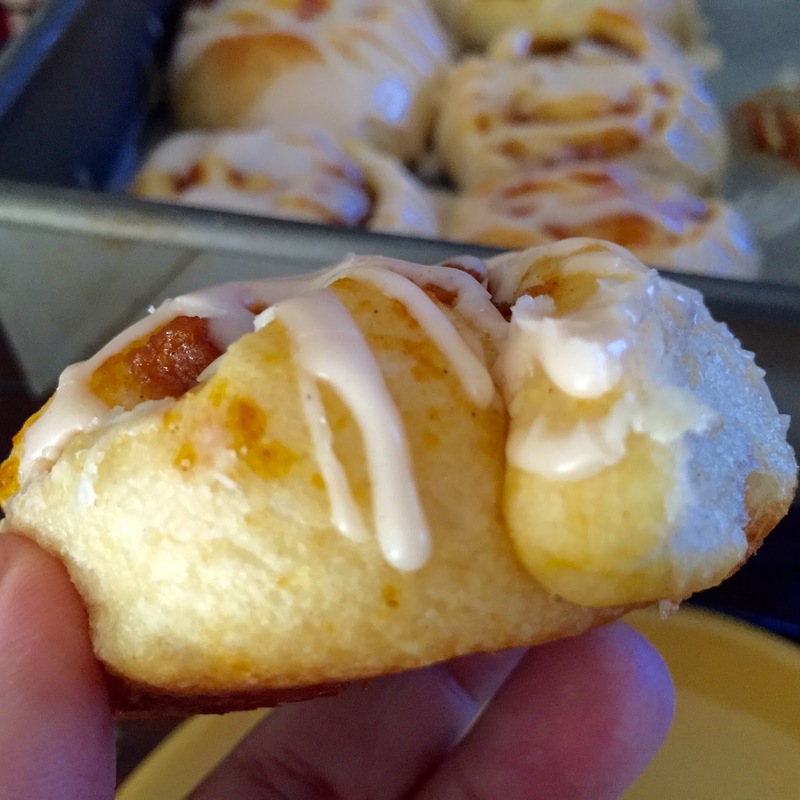 These crescent sheets are perfect for making regular cinnamon rolls, but this weekend, I decided to give them a Fall flavor makeover by adding pumpkin puree to the filling! This simple addition gave the cinnamon rolls a subtle pumpkin flavor without being too overwhelming. Unroll the crescent sheets onto a cutting board. Spread the softened butter into an even layer leaving a small 1/2" border on the long/wide end that is farthest from you. Spread the pumpkin mixture over the butter in an even layer leaving the same 1/2" border. 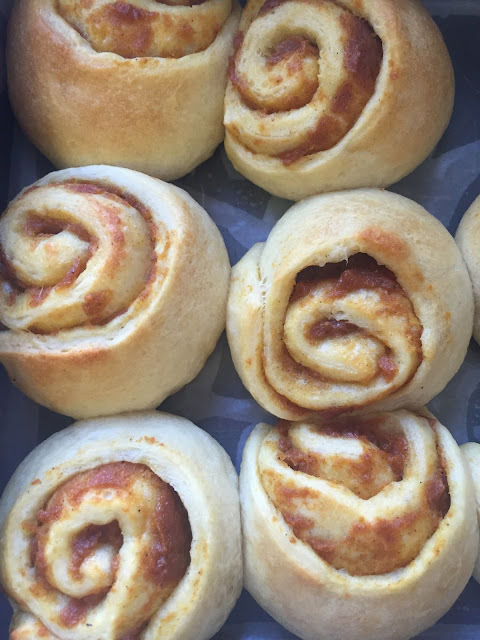 Starting with the long end that is closest to you, roll the dough towards the other end rolling as tight as possible without causing the filling to ooze out of the ends. Using your hands, shape the log so that it is smooth and evenly shaped, gently pressing in the ends if needed. Cut into 8 rolls. Note: you'll have a blank spot in your baking pan which is totally fine. Place the rolls in the baking pan (I had 2 rows of 3 and 1 row of 2) and bake at 375f for approximately 18 minutes or until lightly golden brown and done. Remove from oven and place the pan on a wire cooling rack to cool for a few minutes. While the rolls are cooling, make the glaze - place the powdered sugar in a med size bowl, add the cinnamon, vanilla, salt and maple syrup. Stir to combine. Add a tablespoon of the milk/half & half and stir well to combine. Add additional milk a little at a time, stirring after each addition, until you reach your desired consistency. The glaze should be thick but should be able to drizzle with a fork or spoon. Serve warm or room temp & enjoy! Store leftovers - what leftovers? I guarantee there won't be any! But if there are, store at room temp in an air tight container for one day. The beginning of September means Labor Day and back to school! This month's Leftover's Club swap had a back to school theme. My partner for this month, Francesca from My Pixie Steps, has a new blog and is also new to The Leftovers Club. Welcome Francesca! 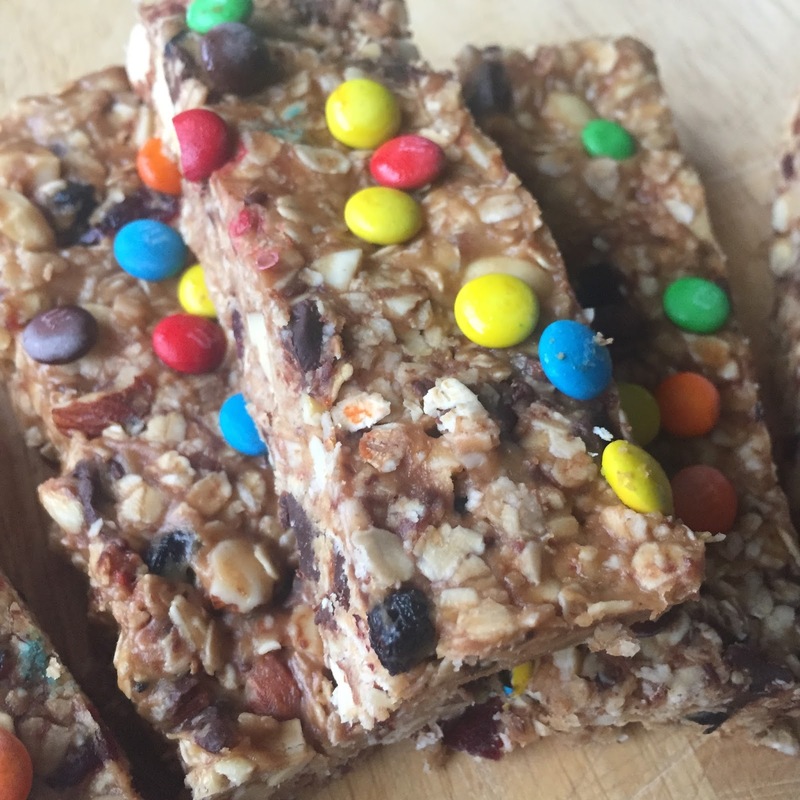 Francesca's blog is all about her journey towards eating healthy and she has shared several great looking healthy recipes on her blog so far. You should go check it out! On her blog, Francesca mentions she has kids so I wanted to make a healthy, back to school treat that her whole family could enjoy. Homemade trail mix is healthy and can be easily customized to suit your tastes. I used homemade trail mix to make these Monster Cookie Granola Bars using a variety of dried fruits and nuts (almonds, cashews, dried cranberries, blueberries and dark chocolate) sweetened with honey and peanut butter. I meant to throw some flax seed in there, but forgot! At the last minute I decided to decorate the top with a few mini M&M's. I know, not very healthy, but hey you have to indulge a little bit sometime, right? This recipe is super fast and easy to make (no bake), even the kids can make it on their own. I hope you give it a try! If you'd like to join the The Leftovers Club, like Francesca did, and swap yummy goodies with fellow bloggers, please sign up over at Food Ramblings. Elizabeth does a great job of organizing the swap every month. I guarantee you'll have a lot of fun! Line an 8x8 baking pan with nonstick foil or parchment paper. Set aside. Coarsely chop the cashews, almonds and cranberries. 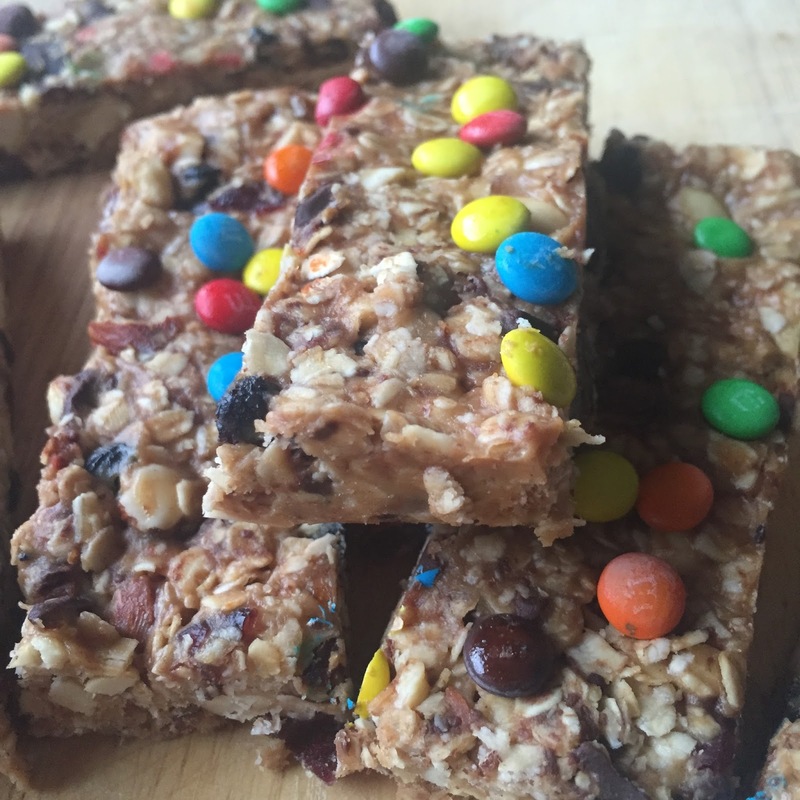 Place them in a large bowl with the oats, dried blueberries and chopped dark chocolate chunks. Place the peanut butter in a small microwaveable bowl. Heat for 35-40 seconds or until melted. Remove from the microwave and add the honey and sea salt. Stir well to combine. Allow to cool for a bit until room temp but still loose. If the peanut butter is too hot, it will melt the chocolate. Pour the peanut butter/honey mixture over the granola mixture and stir well to combine. Dump the mixture into the prepared baking pan and press into an even layer. I wet my hands a little bit to make this part easier. 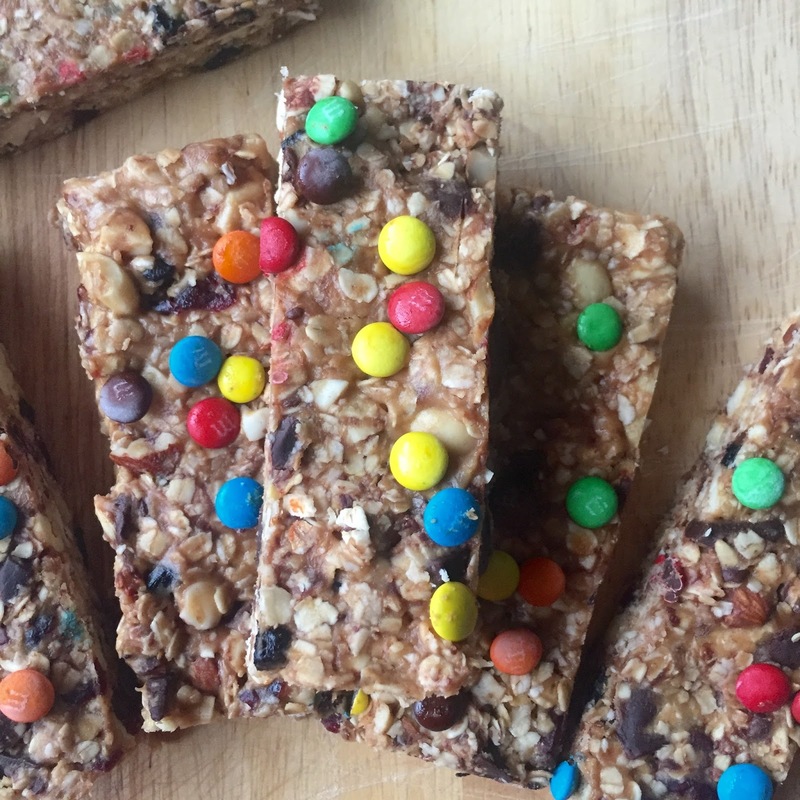 Press well to compact the bars then sprinkle the mini M&M's on top and gently press those into the top to help them adhere. Cover and refrigerate a few hours or overnight to harden. Remove from the baking pan using the foil and cut into bars. Enjoy! Store tightly covered at room temp for up to 5 days or store in the refrigerator (preferred).